Communicating the amount of windstorm induced forest damage by the maximum wind gust speed in Finland Communicating the amount of windstorm induced forest damage Hannu Valta et al. Windstorms are natural disturbance agents in forests playing a role in natural forest regeneration. In Finland, the most severe individual windstorms have commonly damaged 2–4 million m3 of timber. In addition to financial losses caused to forest owners, windthrown trees have in many cases seriously disrupted the functionality of the national power grid. Communicating windstorm risks in duty forecasting is difficult. In this study, we aimed at developing windstorm impact estimates for forest damage in Finland to help the forecaster to improve communication of the risks of windstorms. We have compared the volume of forest damage caused by the most intense windstorms in Finland during the recent decade to the observed maximum inland wind gust speeds associated with the same windstorms. 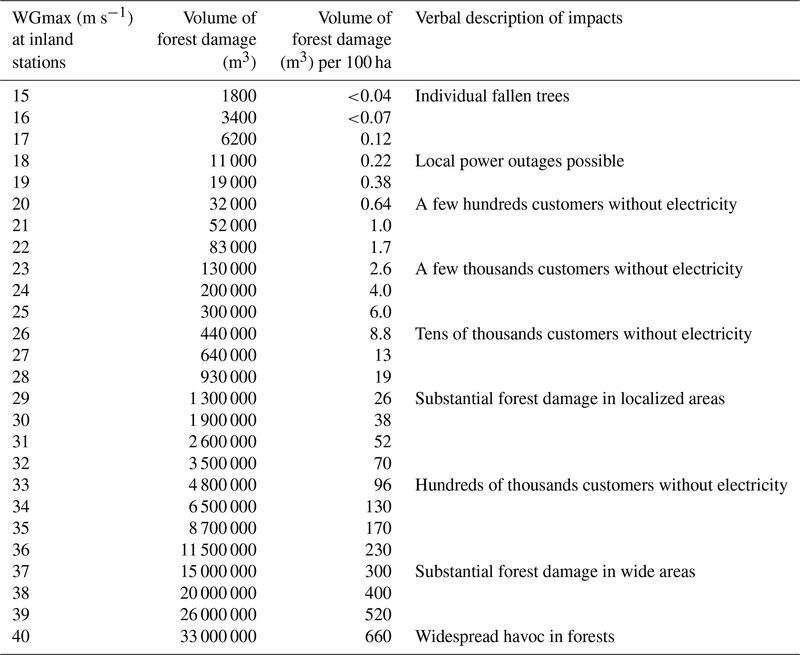 It was found out that the volume of forest damage follows approximately a power relation as a function of wind gust speed with a power of ∼10. This is a tentative estimate because of a short time series and small number of inspected windstorms. Moreover, also wind direction, location of the affected area and soil properties among other factors have an impact to the amount of damage as illustrated in our inspection. Despite the shortness of the time series, we believe that our results demonstrating the steep increase in the impacts of windstorms with an increasing windstorm intensity are valuable. However, more detailed investigations with longer time series are needed in order to more specifically communicate the windstorm risks and their impacts in boreal forests. 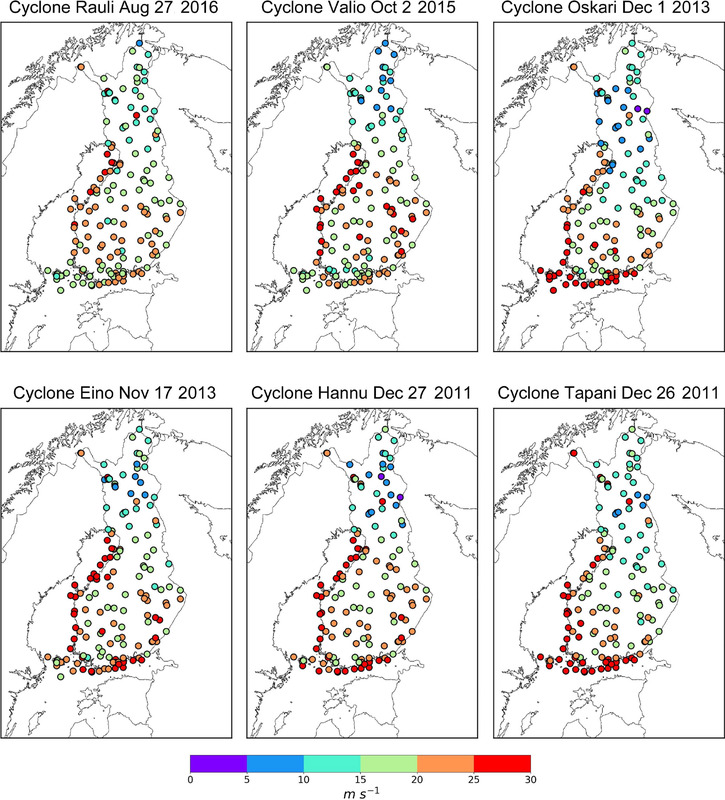 Valta, H., Lehtonen, I., Laurila, T. K., Venäläinen, A., Laapas, M., and Gregow, H.: Communicating the amount of windstorm induced forest damage by the maximum wind gust speed in Finland, Adv. Sci. Res., 16, 31-37, https://doi.org/10.5194/asr-16-31-2019, 2019. Windstorms are among the most hazardous abiotic disturbances affecting the northern European forests (Schelhaas et al., 2003; Kuuluvainen and Aakala, 2011; Mitchell, 2012; Gardiner et al., 2013; Gregow et al., 2017). Largest forest damage have been proven to occur when forests are impacted by wind gust speeds that exceed 35 m s−1 (e.g., Usbeck et al., 2010a; Gardiner et al., 2013). Recently, it was argued that year 1990 represents a change-point after which the windstorm induced large-scale forest damage have increased by a factor of three in Europe (Gregow et al., 2017). In Finland, approximately 10–25 large scale windstorms occur every year but usually only a few of them are severe. The Finnish forests are especially affected by southerly, south-westerly and westerly winds, and in the central and eastern parts also north-westerly winds are common (e.g., Gregow et al., 2011). The most severe wind damage to forests have occurred during periods when there has not been soil frost inhibiting damage (e.g., Jokinen et al., 2015). Typical to the most severe large-scale storms in Finland is that the mean wind speeds over the marine and coastal stations have been above 25 m s−1 (Gregow et al., 2008). The mechanistic impact models such as HWIND (Peltola et al., 1999) and GALES/Forest-GALES (Gardiner et al., 2000) have been used in assessing wind risk to forests in Finland. The model simulations indicate that trees approximately 20 m tall can be uprooted already if 10 min mean wind speeds are between 15–25 m s−1 (e.g., Zubizarreta-Gerendiain et al., 2012). Thus, Finland is rather vulnerable to severe windstorms. In addition to financial losses caused to forest owners, windstorms and windthrown trees have disturbed seriously the functionality of the national power grid (Pilli-Sihvola et al., 2016, p. 12). Efficient adaptation to wind damage obligate adequate preparedness measures by the society (Nurmi et al., 2019). Table 1The most notable large-scale windstorms in Finland during the 2010s with their maximum observed wind gust speed at inland stations (excluding fell stations) operated by the FMI. The column for wind direction describes the directions of strongest winds associated with the storms. Communicating windstorm risks and their impacts to the public and authorities by the weather forecasters is becoming increasingly important. Already Stern (2006) and Sills (2009) have foreseen the role of future forecasters to be focused on communicating effectively the predicted impacts of hazardous weather events. Traditionally, in operational safety weather services, warnings concerning windstorms and other weather hazards are issued based on the intensity of the forecasted phenomenon, e.g., based on wind speed. This is not sufficient, as an accurate and timely warning does not necessarily prevent major economic disruption or even guarantee safety of life (WMO, 2015). When the status of adaptation to climatic risks in Finland was recently mapped (Gregow et al., 2016), one of the key findings was that actionable impact-based predictions and warnings should be developed and be available. As well, the uncertainties and likelihood of the severe impacts should be communicated (Harjanne et al., 2017). Developing impact estimates to improve communication and as well, in order to concretize the windstorm risks to the society is thus considered extremely vital. 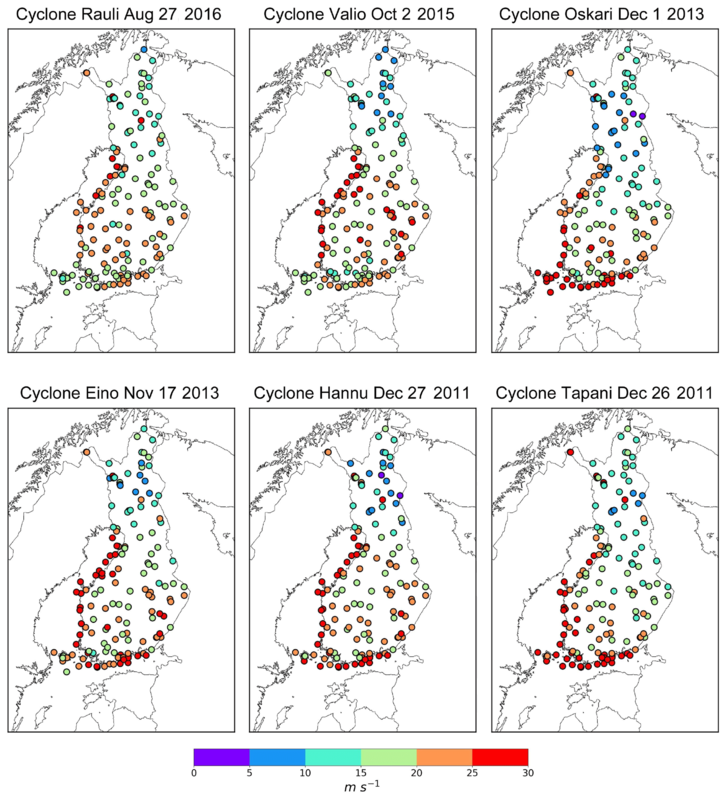 Figure 1Storm tracks for the six typical windstorms affected Finland during the 2010s. Table 2Volume of forest damage as a function of maximum wind gust speed (WGmax) according to Eq. (1). In this study, we developed windstorm impact estimates for forest damage in Finland. We first compare the amount of reported forest damage (in cubic meters of timber) to the observed maximum wind gust speeds associated with the most notable synoptic scale non-convective windstorms in Finland during the recent decade. We use the maximum wind gust speed as it is known that forest damage due to windstorms is best correlated with peak wind speed (Usbeck et al., 2010b). We also consider wind direction and soil conditions in our assessments. We believe that our findings can be valuable for the weather forecasters when they estimate and communicate the anticipated impacts of windstorms in Finland e.g. to power companies and forest authorities and owners. 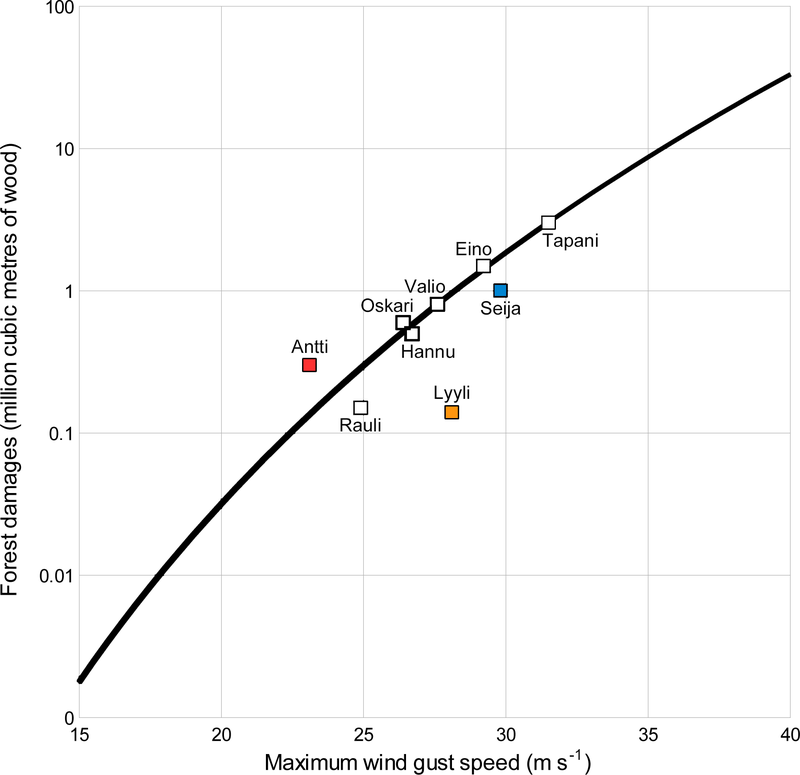 Figure 2The maximum wind gust speed (m s−1) observed at the stations operated by the FMI (coastal and fell stations included) associated with the six large-scale windstorms during the 2010s. In this study we use information from the Finnish Forest Centre, the Finnish Meteorological Institute (FMI) and the European Centre for Medium-Range Weather Forecasts (ECMWF). The number of damaged volume of timber in cubic meters (m3) was obtained from the Finnish Forest Centre. The maximum 3 s wind gust speeds (WGmax) are from the weather stations operated by FMI. Each large-scale windstorm was analysed using the WGmax observed at any inland weather station. With an inland station we refer to all the stations neither located immediately adjacent to the sea nor on fell tops in Lapland. We visualized the storm tracks by employing the ERA5 reanalysis which has 1-hourly output with a horizontal resolution of 31 km (Hersbach and Dee, 2016). The positions of cyclone centres and thus tracks were plotted by using the latitude and longitude coordinates of the minimum mean sea level pressure associated with the cyclones. The tracks are plotted 12 h before and after the time step when the cyclone centre reached Finland. The inspected windstorms are listed in Table 1. 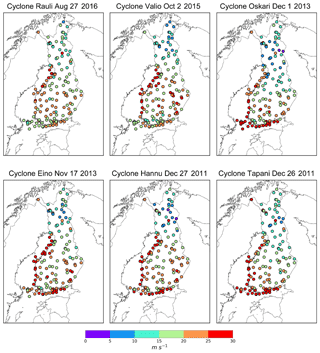 Those are the most severe non-convective synoptic scale windstorms impacted Finland during the 2010s. We did not include windstorms prior to 2010 into our analysis because the observation network for wind gust speeds was earlier sparser. Moreover, information regarding the forest damage was not readily available for all of the elder windstorms. 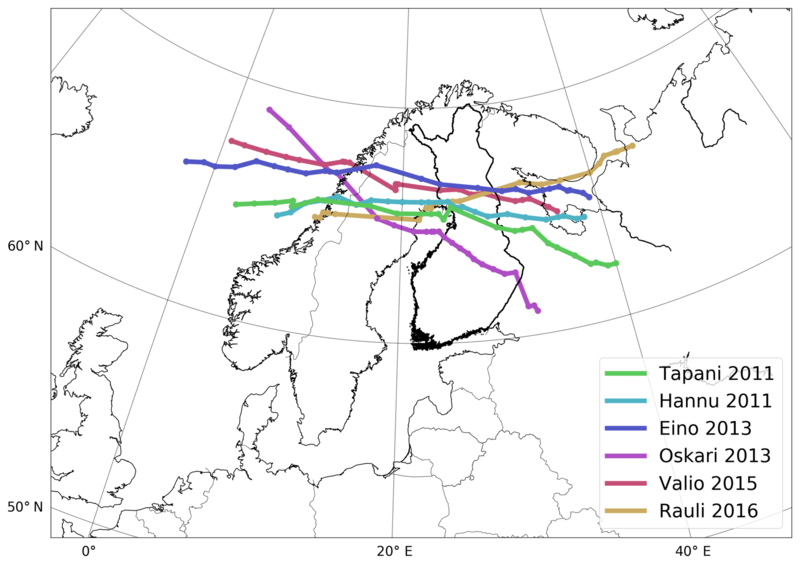 As discussed in the next section, six of the nine inspected windstorms, named Valio, Oskari, Eino, Tapani, Hannu and Rauli had similar characteristics. These windstorms were thus selected to represent typical windstorms affecting Finland and they were used when forming the regression estimate between WGmax and forest damage. Here WGmax is in m s−1, a=(2.858±14.58)×10-15 and b=10.03±1.49. The parameters a and b with their 95 % confidence intervals were estimated by using the R package nlstools (Baty et al., 2015). We moreover estimated the volume of forest damage per 100 hectares by assuming that the damaged area has a spatial extent of approximately 50 000 km2. 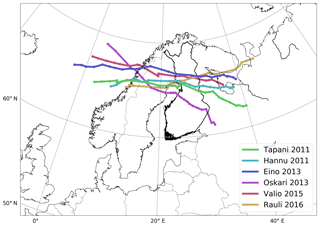 When considering the nine windstorms presented in Table 1, it can be noted that six of them (Valio, Oskari, Eino, Tapani, Hannu and Rauli) had similar characteristics. Firstly, these storms developed over the North Atlantic and their low-pressure centres propagated across central parts (63–65∘ N) of Finland to Russia (Fig. 1). Hence, the storms impacted southern and central parts of country (Fig. 2) and the strongest winds associated with these storms blew from west or northwest. Moreover, they occurred when soil was not frozen. Windstorm Rauli (27 August 2016) occurred in late summer when deciduous trees had their leaves and it impacted a slightly different region with strongest winds concentrated on the coast of Bothnian Bay. Rest of these six windstorms occurred between October and December. Storm Antti (30 November 2012) was different from the six storms having easterly blowing winds. Storm Lyyli on the other hand (23 May 2015) only impacted Northern Finland. Lastly, during storm Seija (13 December 2013) soil was already partly frozen and thus there was already some anchorage to the trees and they were locally less easily uprooted. In Fig. 3 we show the volume of forest damage as a function of observed WGmax for the inspected windstorms. The volume of forest damage estimated by the Eq. (1) is also shown. 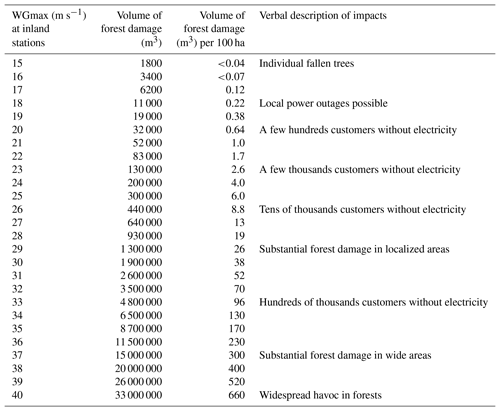 The expected volumes of forest damage caused by typical windstorms according to Eq. (1) are also given in Table 2 with short verbal description of impacts. According to Eq. (1), a 10 % increase in the WGmax leads to almost three times larger forest damage. Local power outages due to windthrown trees are expected when the highest wind gust speeds approach 20 m s−1. When the WGmax exceeds 25 m s−1, already tens of thousands of customers are likely to be left without electricity. Substantial damage is expected with WGmax above 30 m s−1. Figure 3The volume of forest damage as a function of maximum observed wind gust speed for the windstorms during the 2010s in Table 1 and including also the windstorms Janika and Pyry. 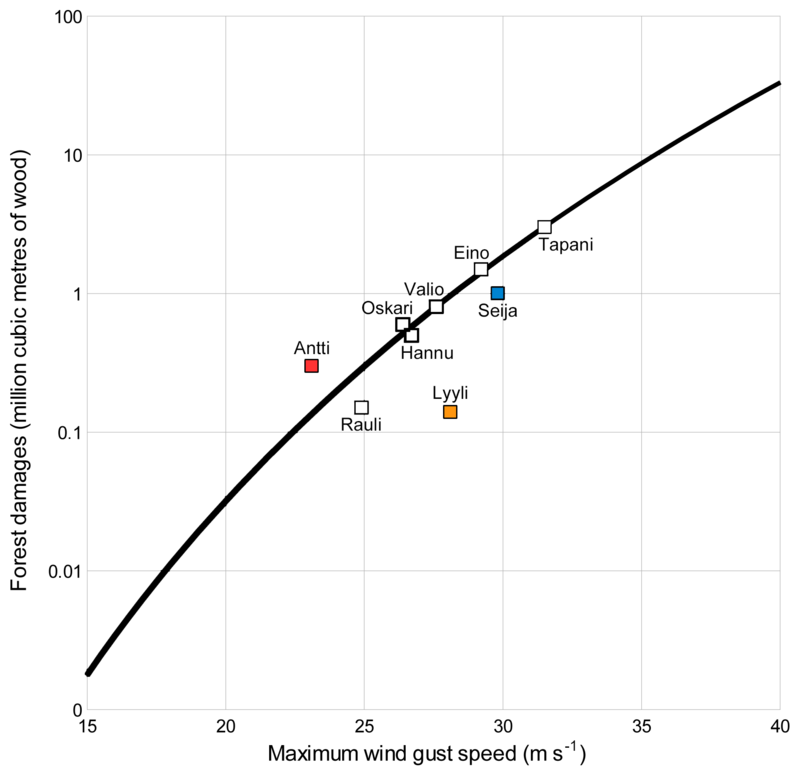 The black curve depicts the best estimate for the power relation between the maximum wind gust speed and forest damage for typical windstorms (open squares). Windstorm Antti with rare wind direction (easterly) is shown with a red square, windstorm Seija with partly frozen ground with a blue square and windstorm Lyyli that raged in Northern Finland with an orange square. The power relation was obtained by employing the forest damage and WGmax of the six large-scale windstorms in Finland. The power relation explains the damage caused by the typical windstorms when the WGmax varies approximately between 25 and 32 m s−1. A post analysis indicates that the weakest windstorm Rauli is poorly estimated by the power relation. The true value of forest damage caused by Rauli was only 0.15 Mm3 but the power relation gave an estimate of 0.5 Mm3. In case of the three storms that were not considered as typical windstorms and were thus not included in fitting the power relation, the forest damage could not be estimated based on the power relation. In the case of Seija storm, the observed damage (Table 1) were only half of those given by Eq. (1) (Fig. 3). This was assumedly because soil was already partly frozen in the affected area. Windstorm Lyyli that raged in northern Finland damaged only 0.14 Mm3 of timber but the estimate based on Eq. (1) would have been almost one million m3. Windstorm Antti having a rare easterly wind direction, on the other hand, caused three times larger damage than estimated based on Eq. (1). Our results show that the volume of wind-induced forest damage in Finland can conditionally be estimated based on a simple power relation as a function of WGmax. The power relation is applicable for large-scale windstorms that affect southern, western and eastern parts of Finland when: (1) the wind direction is between west and northwest, (2) the WGmax ranges between 25–32 m s−1, (3) the soil is not frozen, and (4) the deciduous trees are without leaves. Additionally, the centres of the large-scale storms usually travel across northern or central parts of Finland approximately between 63–65∘ N. With these conditions, the power relation gives reasonable estimates for the likely volume of forest damage in southern or central parts of Finland. On the other hand, it is likely that rare wind direction, i.e., easterly or northerly, substantially increases the forest damage. This is presumably because south to north-westerly winds are most common in Finland and the root systems of the trees have adapted to this typical wind direction (e.g., Nicoll and Ray, 1996). Northerly and easterly winds on the other hand uproot the trees more easily as the root systems on the easterly to northerly sides of the trees are weaker. The power relation of this paper was derived for Finnish conditions. 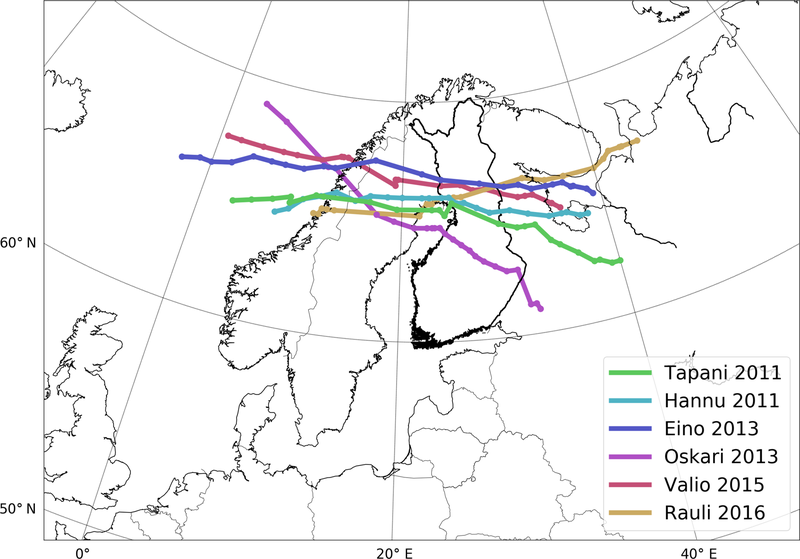 Using this power relation and historical windstorms of the neighbouring countries, the potential damage of similar storms in Finland can be estimated. For instance, in Sweden the most devastating windstorm Gudrun (9 January 2005), damaged approximately 70 million m3 of wood (Holmberg, 2005; Bengtsson and Nilsson, 2007; Gregow, 2013). The measured WGmax during Gudrun was 36–42 m s−1 in coastal regions of southern Sweden and slightly above 35 m s−1 in some inland locations (Holmberg, 2005). If a storm like Gudrun would arrive to Finland, the damage would thus be very high. With the range of wind gust speeds 36–42 m s−1 the damage would correspond to 10–55 Mm3 based on the power relation. Thus, if a storm is forecasted with probabilities for this range of wind gust speeds, we can also give an estimate of the danger it would imply to our forests. 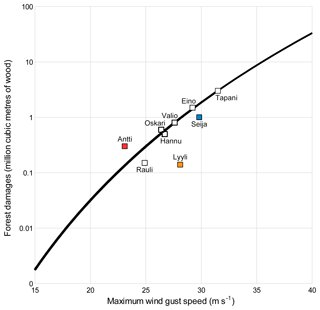 And if the highest wind speeds (42 m s−1) are only occurring over the sea, we can pick the highest wind gust speeds that most probably occur over the land, and give a corresponding estimate for the most likely windstorm induced forest damage risk. This kind of communication would also prepare the society to facing the risks and the uncertainty range in a more concrete manner as was desired by the Finnish authorities in support of adaptation planning (Harjanne et al., 2017). It is unclear whether the power relation of Eq. 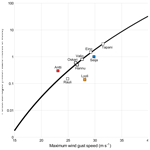 (1) can be extrapolated to more intense windstorms with the maximum wind gust speeds above 32 m s−1, like for the storms comparable to intensities of storm Gudrun. Probably over a certain limit, the volume of forest damage approaches some saturation level and thus a sigmoid function could better describe the relationship between maximum wind gust speed and damage to forests. Moreover, other additional factors are likely to contribute to the amount of forest damage. For instance, soil moisture is known to affect to the damage (e.g., Kamimura et al., 2012). Forests are most prone to wind damage when soil is wet and unfrozen (Usbeck et al., 2010a). This is the situation typically in Finland in late autumn and early winter when most of severe windstorms occur. Notwithstanding, our results indicate that a 10 % increase in wind gust speed leads to almost three times larger forest damage if other conditions remain similar. Moreover, it seems that in northern Finland the volume of forest damage remain much smaller than in southern Finland. We expect this to be depended on the lower tree height and smaller volume of growing stock in the northern forests. Rare wind direction, on the other hand, is likely to substantially increase the amount of forest damage. This was demonstrated by the unexpectedly large amount of damage caused by storm Antti. To conclude, we believe that the data as well as the approach presented in this study will be valuable for the duty weather forecasters who need to communicate the risks and impacts of windstorms on forests in Finland. More analyses about seasonal, soil and forest related aspects resulting in windstorm induced forest damage in the Finnish conditions remain as future work. The forest damage information shown in Table 1 is obtained from the Finnish Forest Centre. The observations from the Finnish Meteorological Institute can be downloaded at https://en.ilmatieteenlaitos.fi/download-observations-questions (last access: 26 March 2019). The ERA5 data can be downloaded at https://climate.copernicus.eu/climate-reanalysis (last access: 26 March 2019). HV prepared the prestudy about the storms based on extensive forecasting experience. IL and HG wrote the paper. TKL prepared the wind gust speed map and storm track figures. AV participated in writing and supervising the work. He leads the FORBIO and WINDSURFER WPs at FMI. ML fitted the power relation to the data and cross-checked the wind gust speed data. All have read and accepted the manuscript for submission. This study has been supported by the Strategic Research Council at the Academy of Finland through the FORBIO project (grant agreement number 293380) and by the WINDSURFER (WIND and wave Scenarios, Uncertainty and climate Risk assessments for Forestry, Energy and Reinsurance) project funded through the ERA4CS ERA-NET and the European Commission. This paper was edited by Haleh Kootval and reviewed by Haleh Kootval and David Rogers. Baty, F., Ritz, C., Charles, S., Brutsche, M., Flandrois, J.-P., and Delignatte-Muller, M.-L.: A toolbox for nonlinear regression in R: The package nlstools, J. Stat. Softw., 66, 1–21, https://doi.org/10.18637/jss.v066.i05, 2015. Bengtsson, A. and Nilsson, C.: Extreme value modelling of storm damage in Swedish forests, Nat. Hazards Earth Syst. Sci., 7, 515–521, https://doi.org/10.5194/nhess-7-515-2007, 2007. 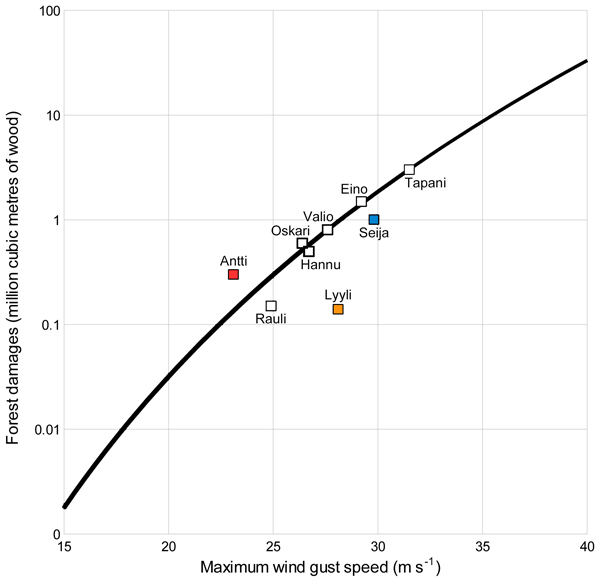 Gardiner, B., Peltola, H., and Kellomäki, S.: Comparison of two models for predicting the critical wind speeds required to damage coniferous trees, Ecol. Model., 129, 1–23, https://doi.org/10.1016/S0304-3800(00)00220-9, 2000. Gardiner, B., Schuck, A., Schelhaas, M.-J., Orazio, C., Blennow, K., and Nicoll, B. (Eds. ): Living with storm damage to forests. What Science Can Tell Us 3, European Forest Institute, Joensuu, 132 pp., 2013. Gregow, H., Venäläinen, A. Laine, M., Niinimäki, N., Seitola, T., Tuomenvirta, H., Jylhä, K. Tuomi, T., and Mäkelä, A.: Vaaraa aiheuttavista sääilmiöistä Suomen muuttuvassa ilmastossa (Danger-causing weather phenomena in changing Finnish climate), Reports 2008:3, Finnish Meteorological Institute, Helsinki, 99 pp., 2008. Gregow, H.: Impacts of strong winds, heavy snow loads and soil frost conditions on the risks to forests in Northern Europe, Finnish Meteorological Institute Contributions No. 94, Helsinki, 44 pp., 2013. Gregow, H., Carter, T., Groundstroem, F., Haavisto, R., Haanpää, S., Halonen, M., Harjanne, A., Hildén, M., Jakkila, J., Juhola, S., Jurgilevich, A., Kokko, A., Kollanus, V., Lanki, T., Luhtala, S., Miettinen, I., Mäkelä, A., Nurmi, V., Oljemark, K., Parjanne, A., Peltonen-Sainio, P., Perrels, A., Pilli-Sihvola, K., Punkka, A.-J., Raivio, T., Räsänen, A., Säntti, K., Tuomenvirta, H., Veijalainen, N., and Zacheus, O.: Keinot edistää sää- ja ilmastoriskien hallintaa (Measures to promote the management of weather and climate related risks), Publications of the Government's analysis, assessment and research activities 47/2016, Helsinki, 36 pp., 2016. Gregow, H., Laaksonen, A., and Alper, M. E.: Increasing large scale windstorm damage in Western, Central and Northern European forests, 1951–2010, Sci. Rep., 7, 46397, https://doi.org/10.1038/srep46397, 2017. Harjanne, A., Haavisto, R., Tuomenvirta, H., and Gregow, H.: Risk management perspective for climate service development – Results from a study on Finnish organizations, Adv. Sci. Res., 14, 293–304, https://doi.org/10.5194/asr-14-293-2017, 2017. Holmberg, L.-E.: Sammanställning av stormskador på skog i Sverige under de senaste 210 åren, Skogsstyrelsen, Rapport Nr 9/2005, Jönköping, 23 pp., 2005. Jokinen, P., Vajda, A., and Gregow, H.: The benefits of emergency rescue and reanalysis data in decadal storm damage assessment studies, Adv. Sci. Res., 12, 97–101, https://doi.org/10.5194/asr-12-97-2015, 2015. Kamimura, K., Kitagawa, K., Saito, S., and Mizunaga, H.: Root anchorage of hinoki (Chamaecyparis obtuse (Sieb. Et Zucc.) Endl.) under the combined loading of wind and rapidly supplied water on soil: analyses based on tree-pulling experiments, Eur. J. Forest Res., 131, 219–227, https://doi.org/10.1007/s10342-011-0508-2, 2012. Kuuluvainen, T. and Aakala, T.: Natural forest dynamics in boreal Fennoscandia: a review and classification, Silva Fenn., 45, 823–841, 2011. Mitchell, S. J.: Wind as a natural disturbance agent in forests: a synthesis, Forestry, 86, 147–157, https://doi.org/10.1093/forestry/cps058, 2012. Nicoll, B. C. and Ray, D.: Adaptive growth of tree root systems in response to wind action and site conditions, Tree Physiol., 16, 891–898, 1996. Nurmi, V., Pilli-Sihvola, K., Gregow, H., and Perrels, A.: Overadaptation to Climate Change? The case of the 2013 Finnish Electricity Market Act, Econ. Disasters Clim. Change, 3, doi10.1007/s41885-018-0038-1, 2019. Peltola, H., Kellomäki, S., and Väisänen, H.: Model computations of the impact of climatic change on the windthrow risk of trees, Clim. Change, 41, 17–36, https://doi.org/10.1023/A:1005399822319, 1999. Pilli-Sihvola, K., Haavisto, R., Nurmi, V., Oljemark, K., Tuomenvirta, H., Juhola, S., Groundstroem, F., Miettinen, I., and Gregow, H.: Taloudellisesti tehokkaampaa sää- ja ilmastoriskien hallintaa Suomessa (Efficient weather and climate risk management in Finland), Publications of the Government's analysis, assessment and research activities 45/2016, Helsinki, 68 pp., 2016. Schelhaas, M.-J., Nabuurs, G.-J., and Schuck, A.: Natural disturbances in the European forests in the 19th and 20th centuries, Glob. Change Biol., 9, 1620–1633, https://doi.org/10.1046/j.1365-2486.2003.00684.x, 2003. Sills, D. M. L.: On the MSC forecasters forums and the future role of the human forecaster, B. Am. Meteorol. Soc., 90, 619–627, https://doi.org/10.1175/2008BAMS2657.1, 2009. Stern, H.: The future role of humans in the weather forecasting process – to provide input to a system that mechanically integrates judgmental (human) and automated predictions?, Social Science Research Network, https://doi.org/10.2139/ssrn.947267, 2006. Usbeck, T., Wohlgemuth, T., Dobbertin, M., Pfister, C., Bürgi, A., and Rebetez, M.: Increasing storm damage to forests in Switzerland from 1858 to 2007, Agr. Forest Meteorol., 150, 47–55, https://doi.org/10.1016/j.agrformet.2009.08.010, 2010a. Usbeck, T., Wohlgemuth, T., Pfister, C., Volz, R., Beniston, M., and Dobbertin, M.: Wind speed measurements and forest damage in Canton Zurich (Central Europe) from 1891 to winter 2007, Int. J. Climatol., 30, 347–358, https://doi.org/10.1002/joc.1895, 2010b. World Meteorological Organization: WMO guidelines on multi-hazard impact-based forecast and warning services, WMO-No. 1150, Geneva, 23 pp., 2015. Zubizarreta-Gerendiain, A., Pellikka, P., Garcia-Gonzalo, J., Ikonen, V.-P., and Pelotla, H.: Factors affecting wind and snow damages of individual trees in a small management unit in Finland: assessment based on inventoried damage and mechanistic model, Silva Fenn., 46, 181–196, 2012.